Coraline has used this hull before, but never fitted with a cuddy cabin. Like many Coralines this one was built to order, and among a list of wanted custom features the owner specified a cuddy. The resulting boat looks as though it was designed this way from scratch. 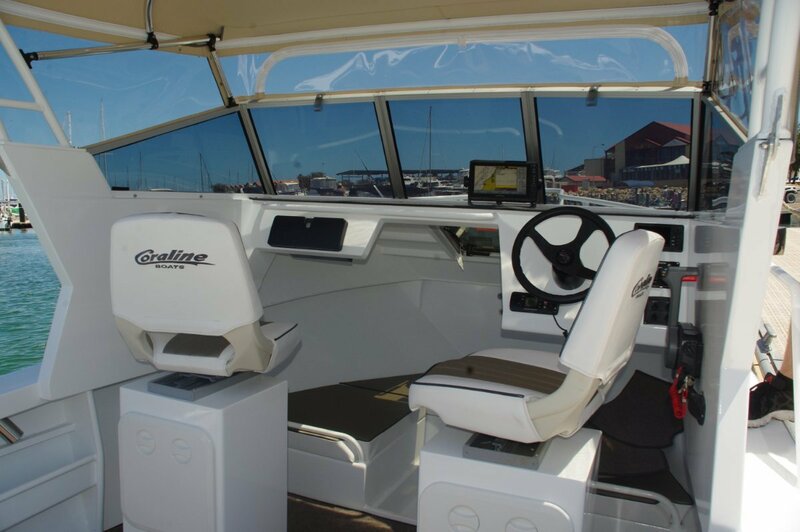 The Bimini covers just the driving position. With clears in place it makes a near enough wind and water proof area for two, which is the likely people load. Besides being a tough item, carried on an even tougher Targa, it has a feature I have never seen on a trailer boat: colour coordination with the hull. The Bimini is tan coloured, the hull cream, the two separated by the white upperworks. The concept really takes the eye and it worked for me – an opinion backed up by a few spectators. The inevitable early question from the female half of a boat-buying couple is, “Where is the toilet”? Indicating the all-purpose bucket or pointing at the ocean is not an acceptable response. Possibly this is a solo owner, or he may have bought the boat as a surprise. For many buyers toilet housing is the cuddy’s main reason for its existence. If a woman points out the error of his ways, they would be simply fixed by a soft bulkhead with zipped door screening off a chemical toilet. A clear fore hatch and side ports would provide the lighting. Of course the cuddy has other reasons for its existence. The bunks are on the short side but, with an infill in place, a couple of children especially could stretch out. Or perhaps more realistically play with electronic games. The certain use it will get is dry stowage. 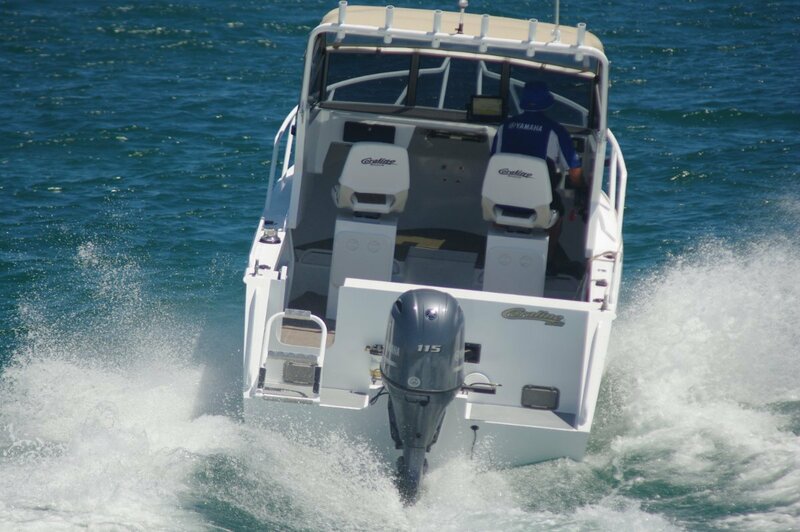 The 555 has the standard features associated with Coralines: self draining deck with big scuppers; transom door to a boarding ladder equipped with deep treads; abundant storage; non-slip side decks; a large total length of safety rails, and a five year structural warranty. There are also special features. Two of the big trends of the moment are pot haulers and powered anchor windlasses. The link between them of course is reduced manual effort and, with the vastly increased weight of pots on recreational vessels in recent years, the former can be well justified. The 555 has a heavy duty system with a particularly well made tipper. Windlasses are perhaps harder to justify on a six metre boat, but the one fitted was well chosen. All the chain and rope in the anchor cable is hauled by and stowed on a drum. As far as anything mechanical can be foolproof this is the one. 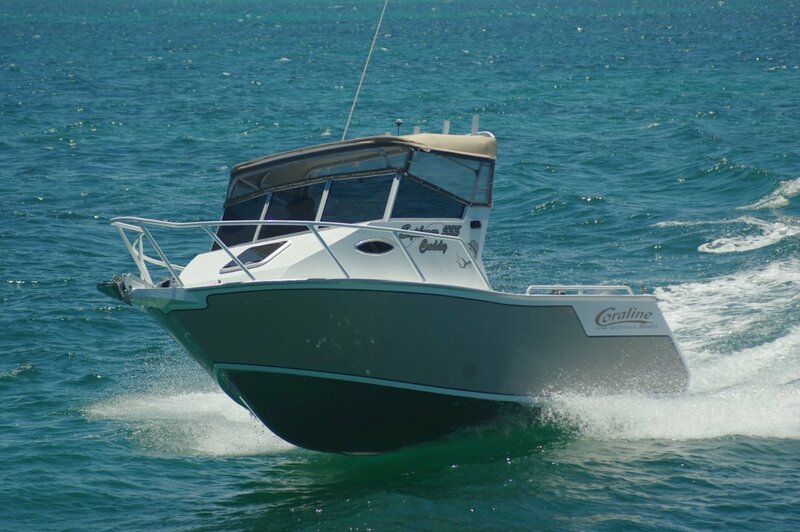 Dedicated fishing equipment includes rocket launchers on the Targa and in the coamings. The latter are in stainless steel and insulated from the aluminium structure. The underdeck catch tank is huge and, for days of big sea or swell, can be flooded for ballasting to ease motion and on any day to increase stability at rest. For occasions with more than two on board there is a settee at the transom. This is easily removed for leaving at home on other occasions, opening up a useful deck area covered by marine grade carpet. 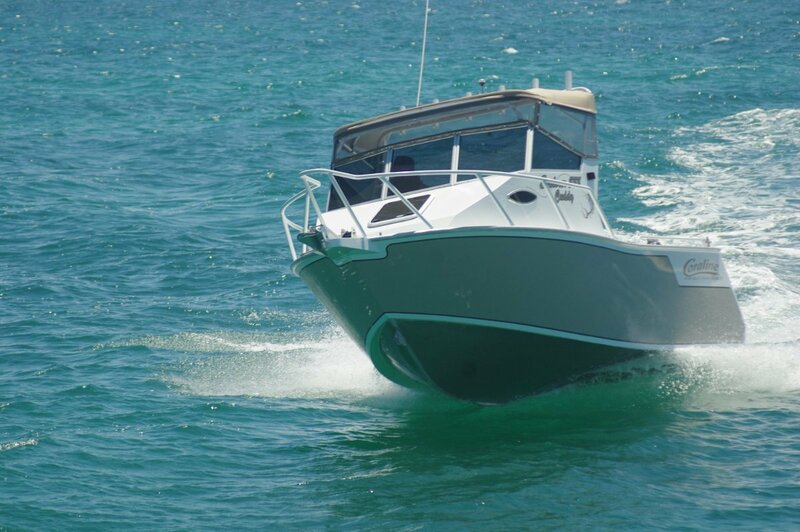 The 555 follows Coraline’s invariable rule: no paint where boat contacts jetty or other boat. So the rubbing strake really is available for rubbing harmlessly. Some builders forget the bow rails, flaring them out for appearance’s sake, and effectively making them the first contact point. Coraline have ensured that the bow rails are within the deck’s perimeter. It was one of those “Are we having fun yet”? days. Lots of motion, a few hardish landings – the kind of day when smart people go bicycle riding instead. The 555 coped very well, allowing us to use all 115 horsepower from time to time, and for once I appreciated clears around me. I also liked the seats; just the right resilience and equipped to slide and swivel. The dashboard grab rail justified its existence too, along with a foot rail. A thoroughly sorted boat.